Blowfish is a morning hangover remedy that's backed by science and guaranteed to work. Or your money back. Blowfish is real medicine and the only hangover remedy whose safety and efficacy are recognized by the FDA. Blowfish delivers the medicine your body needs while the effervescent formulation means it works fast and is gentle on your stomach. Blowfish for Hangovers is specifically formulated to treat hangover symptoms including headaches, dehydration, fatigue and impaired mental function. And Blowfish's pharmaceutical-grade caffeine and effervescent formulation is gentle on your sensitive, hungover stomach. 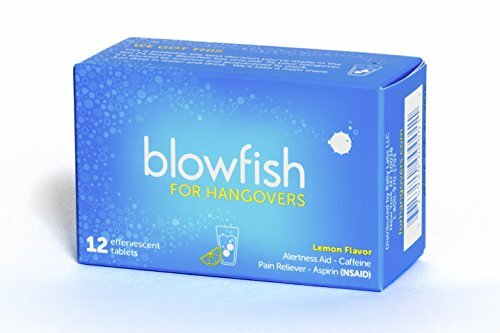 Blowfish is America's #1 hangover remedy because it's like a complete hangover kit in one easy to take formulation: pain reliever, caffeine, effervescence and water. Just drop two tablets in 16 ounces of water, and drink when the fizzing stops. If hangover symptoms return or you start to drag later in the day, Blowfish can be taken every six hours (do not exceed 8 tablets in 24 hours). Unlike other products that make false Òhangover preventionÓ or Òhangover cureÓ claims, Blowfish is the only hangover product with a formulation that's recognized by the FDA as safe and effective. That's why it's been featured by The New York Times, The Today Show, The BBC, Men's Health, GQ, The Doctors, The Chive, BroBible, and BuzzFeed. Order Blowfish now so it's close at hand next time you need it. Because, let's be honest, at some point you will. Blowfish for Hangovers is FDA-recognized, Kosher, Vegan and Gluten-Free. BEST HANGOVER REMEDY - Blowfish is the only hangover remedy with a formulation that's recognized as effective by the FDA. It's real medicine, backed by science and guaranteed to work. Or your money back. TAKEN IN THE MORNING - Blowfish is more convenient than so-called "preventatives" because it's designed to be taken when you wake up. In the morning, just drop two tablets in water to make a refreshing lemony drink. You'll start feeling better in no time. TREATS HANGOVER HEADACHES FAST - The maximum strength aspirin in Blowfish eases the pain of the hangover headache, and the effervescent delivery method gets the medicine into your system twice as quickly as pills. ENERGY WITHOUT THE UPSET - Caffeine helps relieve hangover symptoms and dramatically increases the effectiveness of pain relievers. Coffee is very harsh on already uneasy stomach, which is why Blowfish uses pharmaceutical caffeine in an effervescent form that is gentle on the stomach and gets you going quickly. DON'T BE FOOLED BY OTHER PRODUCTS CLAIMING TO BE "HANGOVER CURES" - While other products have hundreds of fake reviews, Blowfish is the only hangover product with a formulation recognized by the FDA. It's like a full hangover kit in one easy package. Just wake. Drop in water and drink. Hangover solved. If you have any questions about this product by Blowfish for Hangovers, contact us by completing and submitting the form below. If you are looking for a specif part number, please include it with your message.